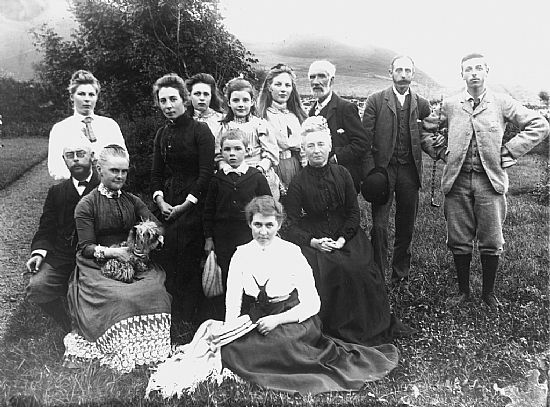 By 1891 the population of Canna had fallen to 102, but not as a consequence of enforced land clearances. By all accounts Thom was a considerate owner who cared for the families on the island and invested in carrying out improvements to the island properties. He also invested heavily in the infrastructure of Canna, and added to its amenity for his enjoyment of the islands and that of his immediate family as a recreational and sporting estate. For some reason, perhaps on ideological grounds, John Lorne Campbell gave short shrift to the achievements of his predecessor, who is given barely two pages in his, otherwise most comprehensive, history of the island. Curiously, given that so much other investment was being made on the islands, little by way of improvement was undertaken to the mansion house. Changes were mostly superficial, with the exception of the single storey timber framed garden room overlooking the garden which appears to have been added in the 1890s, which he used as a family drawing room to accommodate the numbers of the extended family. John Lorne Campbell was later to use it as a Billiards Room. The garden seems to have been adapted to recreational purposes, with a croquet lawn set out ready for a game in contemporary photographs. He erected a flagpole in the front garden, and added the carriage driveway to the front of the house which required a new enclosed compartment to be added to the walled garden at the southwest corner. To improve the setting of the house, he planted up the slope to the immediate rear of the walled garden with amenity woodland. The stand of Corsican pines may have followed in 1911. He may have carried out improvements at the Bothy on the shoreline by introducing the external cast iron stairs to the first floor loftspace for storage, and he added the storage building with the low-pitched roof clad in corrugated iron at the eastern end of the range. It has often been assumed that John Lorne Campbell’s date – 1905 -for when Robert Thom built the house at Tighard for his son Allan and his new wife, Mary Cameron of Talisker (who he had married in 1896) is correct, but it had been erected already by the time that the survey work had been undertaken in 1898 for the publication of the Second Series of Ordnance Survey maps. It is a house which, at first sight, appears somewhat out of place, almost as though its origins had been in suburban Helensburgh, close to where Robert Thom had his house at Barremman. It was as though he was more comfortable with transferring the familiarity of the Clyde to Canna. Allan chose eventually to stay on the island, moving into the mansion house after Robert Thom’s death in 1911. A major investment saw the erection of the pier, for which Thom sought a harbour order, dated 1892. He built it to be long lasting, of dense greenheart timber. There had been only a single structure in this location in 1877, and around it a whole series of storage sheds and stores was spurned. The largest of these, a timber framed building set on dwarf stone walls and referred to as the ‘coal shed’, was occasionally used as a village hall for the island community. Dances were organised there until the outbreak of the Second World War. There had also been a shop on the pier to serve the community and the visiting boats at the pier, housed in a corrugated iron shed; Morag Steele had run it until the 1940s. The success of the pier was immediate – not only did it provide better landing facilities but it attracted fishermen from Barra and Eriskay, who landed their catches on the quayside where fish gutting troughs were set up, creating some welcome seasonal employment for women and men alike. Some of the small huts erected on the extension of the quayside accommodated seasonal workers at the fisheries station. The trade collapsed once the railhead opened up at Mallaig, but the colourful names of the herring trawlers, daubed in paint on the face of the cliff at the entrance to the harbour, bear testimony to a time-honoured association of the islands with the fishing banks around the southern coastal fringes of the islands. Communications with the outside world were also assisted by the creation of a Post Office in the structure where the Roman Catholic chapel is now; apparently it had been in use as the island’s place of worship previously, before St Edward’s Chapel was erected. A telegraph cable was laid in 1899 to connect the island with Rum, Eigg and Skye. Leaving the outliers at Coroghon and Tarbet, Thom centralised the farming activities by creating a mains farm at Rhu-na-Cor, which was given the name of The Square. A distinctive structure with twin barrel roofs clad in corrugated iron was added to the earlier farm steading. It covered a large footprint and incorporated a covered cattle court and a steam boiler to drive the farm machinery and the threshing mill. The boiler blew up spectacularly in the mid-1920s, causing considerable damage. The old water-powered corn mill would have been redundant by this stage, and was probably taken down for the smithy to be erected on the same site, although it is possible that part of it was retained and adapted for the purpose. Blacksmiths were an essential component of island life, and were needed for the shoeing of horses and for the fabrication and repair of farm machinery. The occupation of blacksmith had been registered on Canna in the earlier census records of the nineteenth century. At Coroghon there were wooden sheds as well as substantial stone buildings, all now demolished, on the other side of the track adjacent to the barn. One part of the upper floor of the old barn had been converted by Robert Thom into a bothy. Thom also invested in new lengths of road on the island to cut out some of the more circuitous routes around the head dyke. The Second Edition Ordnance Survey map begins to show the extent of Robert Thom’s improvements to the housing stock of the island. Kate MacLeod’s Cottage (known later as Kate’s Cottage) appears on the heights at Keill (where stone shells were shown on the earlier map), and still on Canna a more substantial two storey house had been erected at Doirlinn, with distinctive twin gables of the Hebridean pattern (since removed). On Sanday the cluster of houses overlooking Iolann an Eilein appear to have been abandoned by this stage, and it appears some of the other dwellings on the shoreline had still to be improved. At the Point, Thom had erected one of the pair of houses there, overlooking the sea approaches to the harbour for the captain of his yacht, together with a boathouse. It was known alternately as Point House, or the ‘Skipper’s House’, and later, by when it is assumed that another house had been added, it was awarded to Allan MacIsaac by Allan Thom when he returned an officer from the Great War. To the south of the chapel, and close to the face of the stone quarry at the east end of the rocky outcrop of Creag Liath a small cottage had also been erected by 1898 on the line of the field dyke; the corrugated sheds were to arrive later, as they do not appear on the Second Edition map. Robert Thom was approached in 1886 by the Marquess of Bute for permission to erect a commemorative chapel to his father-in-law, Lord Howard of Glossop. The original intention to site the chapel on Eigg, where the denomination of the population was also Roman Catholic, had fallen through. Bute’s architect had been the assistant to William Burges in Cardiff. Prone to drinking, and occasional bouts of depression, the rigours of building in such a remote location with a builder whose work and diligence he could not rely upon drove him to despair. In 1889 he wrote to the sculptor, Thomas Nicholls, who carved the animated stone heads within the chapel: ‘I’ve had more trouble with this little church than though it had been a great cathedral. I’m heartily sick and tired of it’. This was written three years after his first visit and the building was not to open for worship until 1890. It stands, if a somewhat alien and unexpected form within this island landscape, a beacon to shipping on the approach to the harbour. Thom identified a quarry in the vicinity, from which the external walls were constructed. Despite his disaffection for the project, the architect found room to praise the proprietor of the island, considering him ‘exceedingly kind’. If St Edwards is a gaunt, somewhat overbearing building, Allan Thom’s commemorative church erected lovingly after his father’s death captures the spirit of the old Celtic church much more effectively, even though the denomination is Presbyterian. Completed in 1914, it is a model of simplicity, restraint, and elegance. Its architect was Peter McGregor Chalmers, a master of ecclesiastical architecture in Scotland at the turn of the twentieth century. Harking back to numerous Irish early medieval round tower precedents, of which examples are to be found at Brechin Cathedral and at Abernethy, he based the design on that derived for the church of Kilmore at Dervaig on Mull, which he completed in 1904. As noted above, the Thoms were generally considered benevolent landlords and enjoyed quite a different relationship with their tenants when compared with their predecessor. Robert Thom’s wife would often dispense first aid for the island inhabitants when it was needed, and she encouraged the children to improve their diet by entering the garden where they were welcome to eat the fruits of the orchard. She would also provide them with produce from the kitchen garden. Despite the improved circumstances of those who lived on the islands, opportunities for work were scarce. There was a corresponding drop in the population numbers. 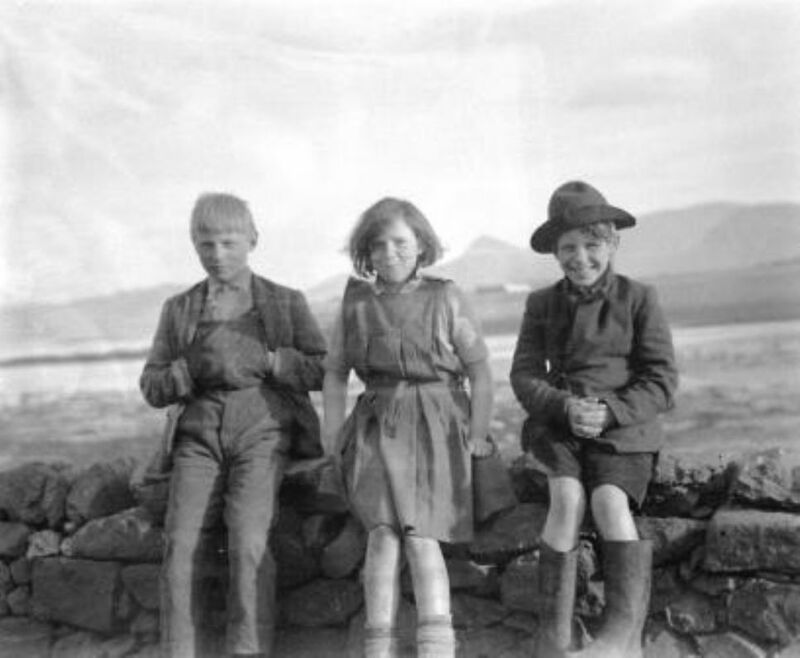 By 1931 there were 60 inhabitants on Canna – less than one half of the number when the Thoms took possession, and within the space of a single decade the number had slumped to 38 when the islands were put up for sale in the closing years of the decade. After Robert’s death, Allan remained on the island, which he farmed in the traditional way. Having paid out the interests of his four sisters in the island he was not left a wealthy man, having none of the capital of his father to continue to make improvements. He worked alongside the tenants, and participated in the island’s social occasions. One of his sons, Robert, returned to Canna and became a director in the island farming business. He was joined later by his brother, Alan, and after their father’s death in 1934 the sons agreed to sell the island in 1938 – a factor in this was the fact that Alan was engaged to be married and was proposing to return to the mainland, leaving Robert on his own. It is reasonable to conclude from the accounts of the Campbells that once they arrived on the island they found the mansion house, and the rest of the infrastructure on the island, in a fairly run down state and in need of investment. It is possible that this tinged their perception of the Thoms’ achievements for the time that they owned Canna, as though to deny the fact that they carried out significant improvements to its infrastructure and amenity, from which they were to reap the benefits.